With all the posts on Ash Wednesday and Lent, I have set to pondering things. I am trying to start some new habits. Since I retired, I have been really bad about procrastinating, or just forgetting, or shall we say, just lost all of my organizational skills. I guess if you don't have to cram 15 errands in the hour after work and before things close, then you don't have to be so organized anymore. I have gotten myself a little notebook and I have daily To Do Lists in there. I make lists. Yes, I admit it. Anyway, so far it's really working out well. 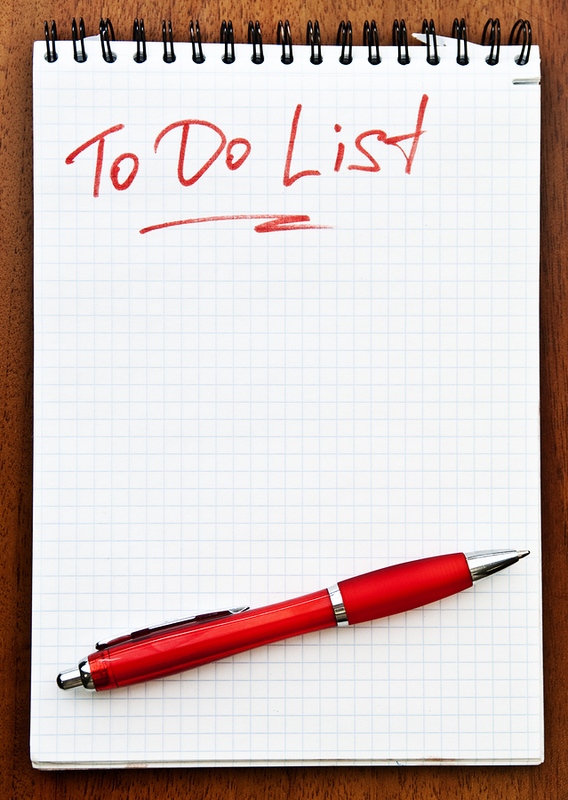 I have gotten more done and I have accomplished some things that I have been putting off for a long time. I have also started to try to de-clutter my life. That means that I am trying to get organized, but that I am also trying to get some STUFF out of my life. I saw on Facebook where somebody issued a 40 days and 40 bags of stuff challenge. I don' t see that happening, but I am going to work toward something. I have already re-arranged the sewing room and made better use of space. I have more floor space for sure and it doesn't feel near as claustrophobic as it did before. I have found lots of stuff that was way way way back in my mind and I had sort of forgotten I had it. I have also challenged myself to make at least one wheelchair quilt each month for a year. Last year our quilt guild made wheelchair quilts for the war veterans home up in Jackson, La, but we really didn't get very many done. They are basically small 27" by 36" quilts. They are fast and easy and a great way to make use of scraps and to try out new blocks. And the benefit to those at the home, well, priceless! These are the ones I made last year. Since we last talked, I've been a busy girl. I have quilted 5 more quilts, made a quilt top, and totally rearranged my quilt room. Not only did I quilt these quilts, but I tried some new things. 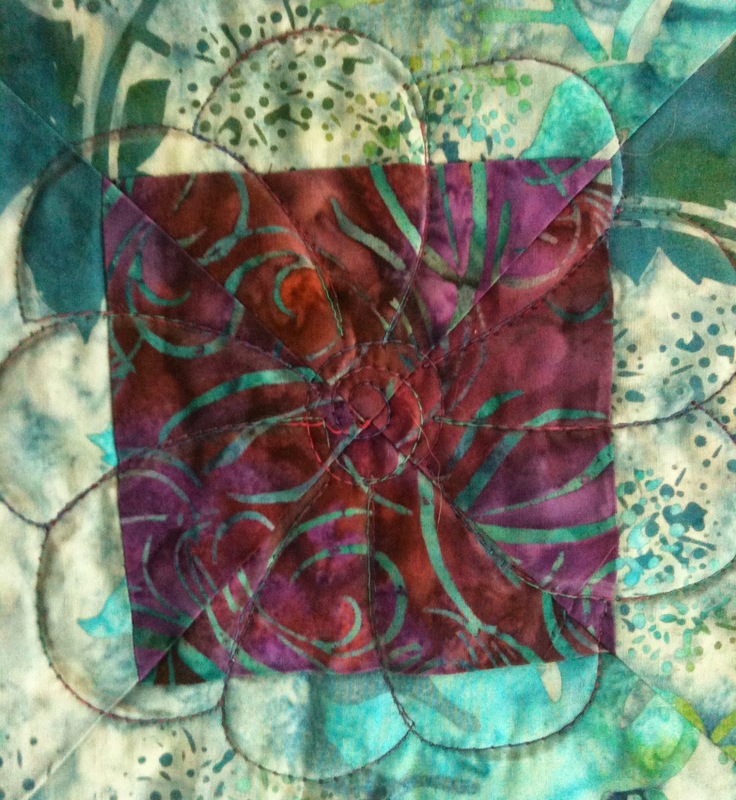 On two of the quilts, I used some of the quilting stencils that I have. I experimented with different ways to mark them since there were lots of different fabrics in one of the quilts and some marking implements worked better than others on different fabrics. As you can see, I even finished it off with my faux piping binding. Love, love, love how fast and how cool! 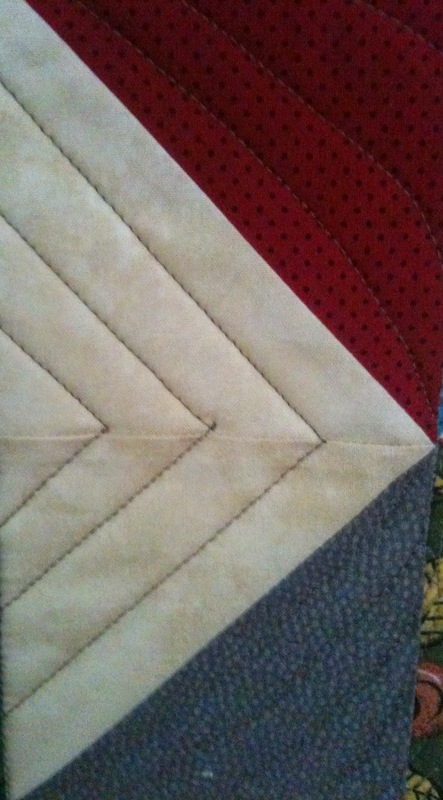 I drew ruler lines on another quilt and used them as reference for some angular quilting. 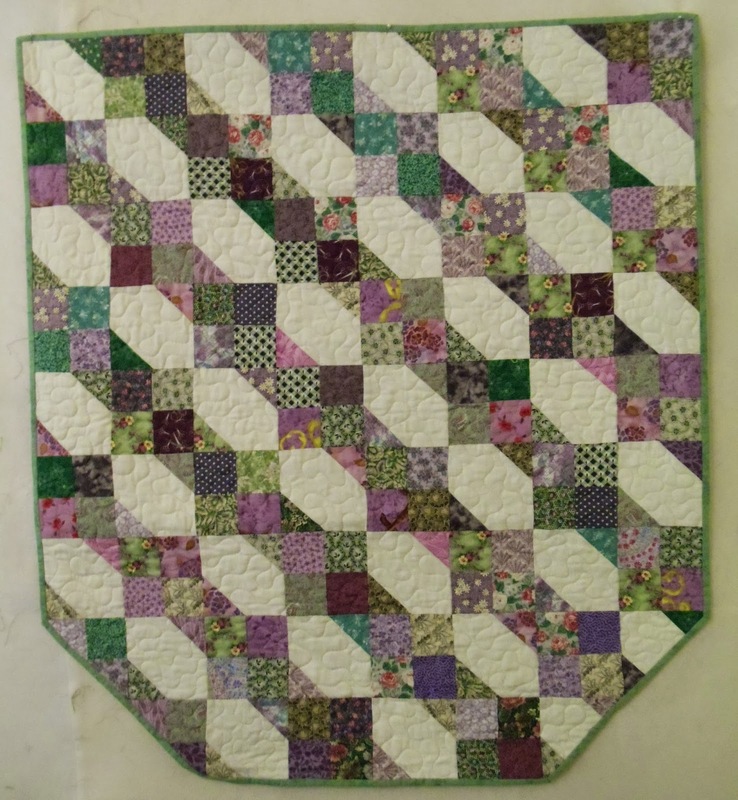 I quilted one for a friend who had believed that she was going to quilt it on her home machine. She already had it marked with a design that she was going to do, so I just quilted on her lines. That was something new as well. I still have at least 12 waiting for me, and most of those are mine. Have a few backs to make and need to get cutting on the batting so they'll be all ready to go. Then I won't have any excuses! Heading out to a retreat this weekend. Oh No! I guess I'll be adding to that pile soon enough. One wheelchair quilt and one baby quilt done. Two down and only twenty-two more to go......Ugh! It has become the bane of my existence! I am terrible about putting things off until they are so overwhelming that I can hardly handle it. I have not quilted in at least 2 months and I now have so many quilts to quilt that I am just overwhelmed at the sheer number of them - over 20. I need to get going, but I can't seem to get motivated. Sometimes I put things off because I imagine them to be hard and I avoid them. Then when I finally get around to doing them I have built up their difficulty so much that I am afraid of them. Only to find out that the difficulty was all in my mind. Sometimes I put them off because I am overly ambitious about what I want to do with them and I don't think I am good enough. Sometimes I put things off because I am just not in the mood. I figure if I am not in the mood that I won't do a good job, so I put it off. I need to just get over it ! That was the program at our latest guild meeting. Who are you and what do you do? Let's get to know each other better. Please bring 1 or 2 examples that embody some aspect of your talent, interest, or quilting specialty, such as, doll-making, weaving, embellishment, beading, embroidery, crochet, fabric dyeing, etc., whatever discipline that you enjoy. ... And it wouldn't hurt to wear your name tag. A good number of our members got up and told us about themselves. What would you say about yourself? 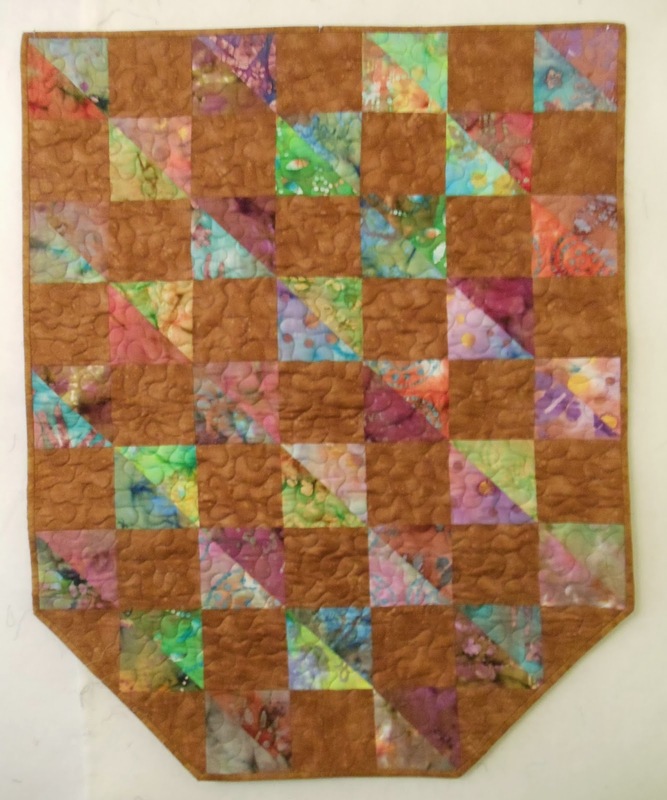 Since I started quilting back in 2008, my tastes have gone through several different changes. The hardest thing for me has always been picking fabrics. Show me a very small group of fabrics and I can pick, but show me a whole quilt store and I just go into a color coma. We had a scrap challenge back in 2009 and I think my whole perspective changed. I love scraps and I like batiks as well, because they mix just like scraps. I am a fan of Bonnie Hunter and I like brights as well as Half Square Triangles. Borders are my least favorite part of a quilt. I can follow a pattern, but I can also look at a picture and make a quilt from it. I frequently improvise. I like modern as well as traditional and contemporary. I enjoy continuing to learn new tips and techniques. Do you ever get tired of making quilts? I was on a guild retreat last weekend and my friend Thelma asked me if I ever get tired of making quilts. I told her "No", but then I had to amend myself. I have moments and days when I just don't feel like working on them, and then I have other moments and days when I want to do nothing but that. But do I ever get tired enough to stop? Never. I don't sew much at home any more. I do most of my sewing on retreats. I enjoy the communal sewing environment. The visiting. The snacking. The sharing of techniques and tricks. I don't sew much at home because I feel guilty. Not guilty for taking the time to sew. But guilty because there is a pile of quilts waiting to be quilted. I tend to do more quilting at home and more piecing on retreats. Quilting is another thing. I just have to be in the mood to do it or I don't do a very good job and am unhappy with the product. Sometimes I don't quilt for weeks or months and then all of a sudden I'll quilt 4 or 5 quilts in a weekend. It's just whenever the mood strikes me. Our quilt guild holds a retreat at the Judson Retreat Center twice a year. The Winter one was this past weekend. There were 23 people attending, I think. Lots and lots of talent in that room! So many lovely quilt designs! This one is from a pattern called Circle Dance. The pattern comes on the package with the Drunkard's Path rulers. I had all the blocks done and several of the rows sewn together before I got there, so I only had to complete 3 more rows and sew them on. Then I ran a stay stitch around the outside to keep it all together until I get it quilted. It was fun, and I do love how it came out, but I don't think I'll be doing any more curves anytime soon. Stressful! Next, I put the borders on my cruise quilt. There was limited space on the cruise and borders are easier to do with lots more space to lay the quilt out and measure and such. I do love the quilt with all of the bright Caribbean colors. It'll be a nice memento of the trip. Next, I worked on my Bonnie Hunter Mystery. 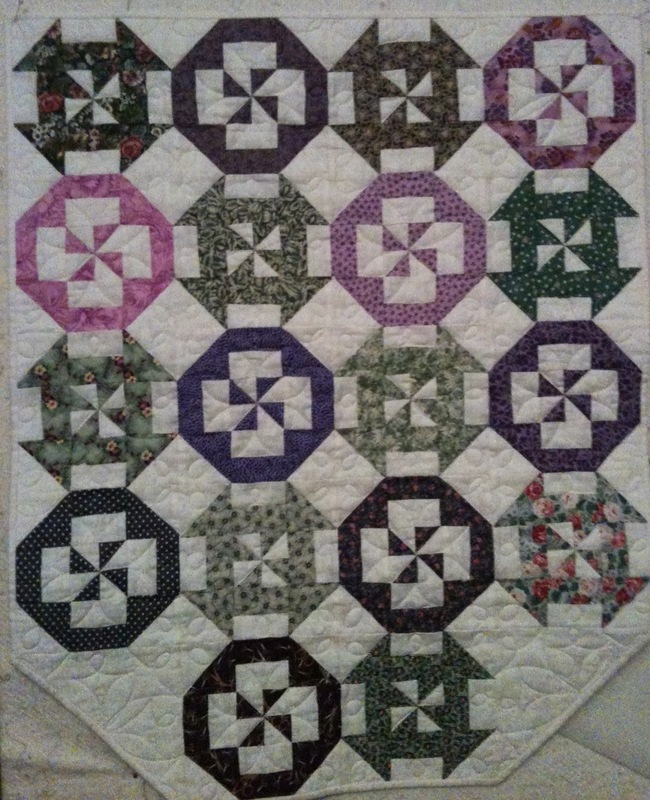 I had all of the pieces and the blocks and even had 3 rows sewn together before I got there. This is one BIG quilt and with all of the pieces and all of the seams, it is heavy already. It measure about 88 inches by 88 inches. When I was working on it, I was worried about all of the loud colors that did not appear to go together, but once it was all assembled, it just worked. 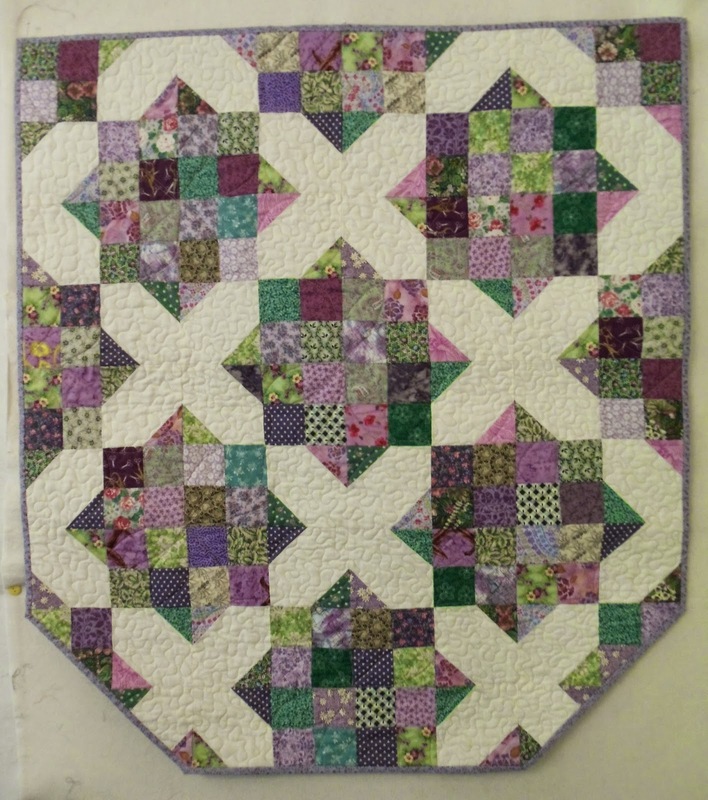 And next, I worked on this sample for the quilt shop where I work. I love this pattern. Lots of the ladies at the retreat were writing down the name of the pattern (Radiant) so that they could get it for themselves. I heard musings about shades of green and somebody else was thinking purple. I spent Saturday afternoon in bed with a bad headache, but I was done with all of the projects I brought to finish, so on Sunday, I had to dig into my contingency fabric. Yep, I brought along a roll of batiks, just in case I ran out of projects. Had no special plans as to what to do with them, but sure was a good thing I brought them. I decided to make another quilt like my cruise quilt only with radically different fabric. I made 50 blocks and they will be ready for my next retreat. Mom loves to lay them out and switch them around until they are just right. I'll let her do that on our coming retreat and then I will be ready to sew them together. I show pictures then. That was the name of the cruise my friend Sarah and I went on. We had a really good time and made lovely quilts. The cruise was hosted by Quilt Retreat at Sea and our teacher was Carol Gibson-Weik. We had 16 sewers, one of which was a man. There were also the teacher, the quilt shop owner, the sewing machine suppliers, the travel person, and a few husbands. I think there were 33 of us all together. We took up a whole section of the dining room. Speaking of the dining room......Wow! Our cruise was on Royal Caribbean's Serenade of the Seas out of New Orleans. 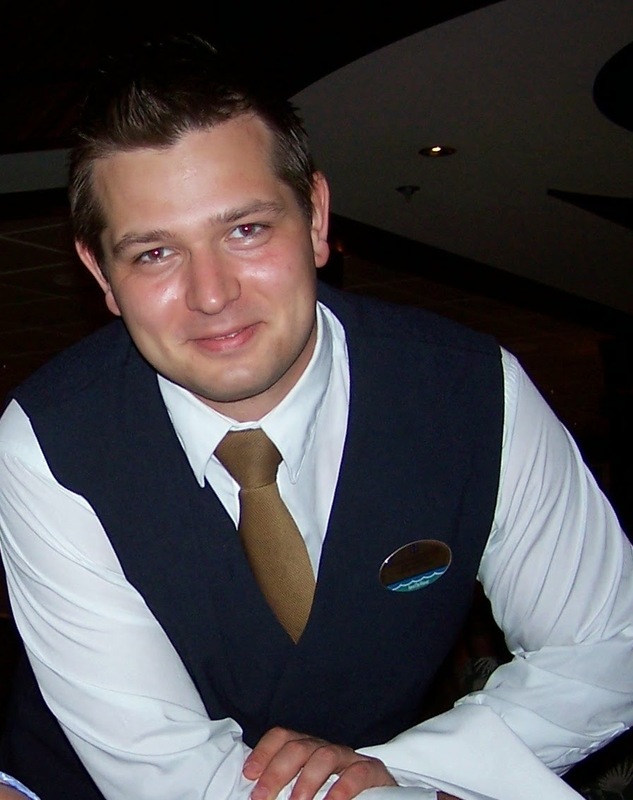 Our wait staff was fabulous and the food was beyond wonderful! We met new quilty friends. One was even working on the Bonnie Hunter Winter Mystery. We saw some wonderful sights in Jamaica, Grand Cayman and Cozumel and sampled some of the local fare. And there were cute little surprises awaiting us in our room. I would certainly do it again! We need to find one that leaves from somewhere near here so we don't have to spend too much to get to where it starts. We are currently looking. My Bonnie Hunter Grand Illusions Mystery is finally complete. It is a huge quilt and it weighs as much now as a top as a fully quilted quilt would weigh. It's gonna be something when it is quilted. This was my first time participating in a Bonnie Hunter Mystery. I have watched them before but not participated. I'd certainly do one again. It was fun!